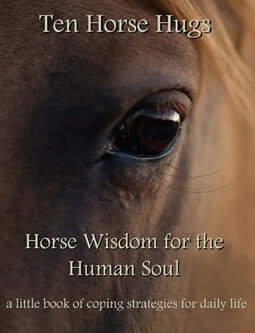 Remembering Joey's Teachings | The Equine Connection Coaching Services Ltd.
On January 17th, we buried our sweet Little Joe. While he was with us, he taught us about the importance of acknowledging, accepting, and living with our vulnerability. He demonstrated how making space for our challenges is simply part of treating ourselves with respect. It does not make us weaker. By filling out all the various parts of ourselves, we experience our wholeness. I will never forget how he woke me up one night with his worried whinnying. I thought maybe that Chunky, his then pasture mate, had escaped and Joe was uncomfortable alone. However, when I went outside, Chunky was by Joey’s side. I thought perhaps he could smell a bear. I decided giving the ponies extra hay was a good solution. In the morning, I saw Vienna, the herd boss, comforting Joey. 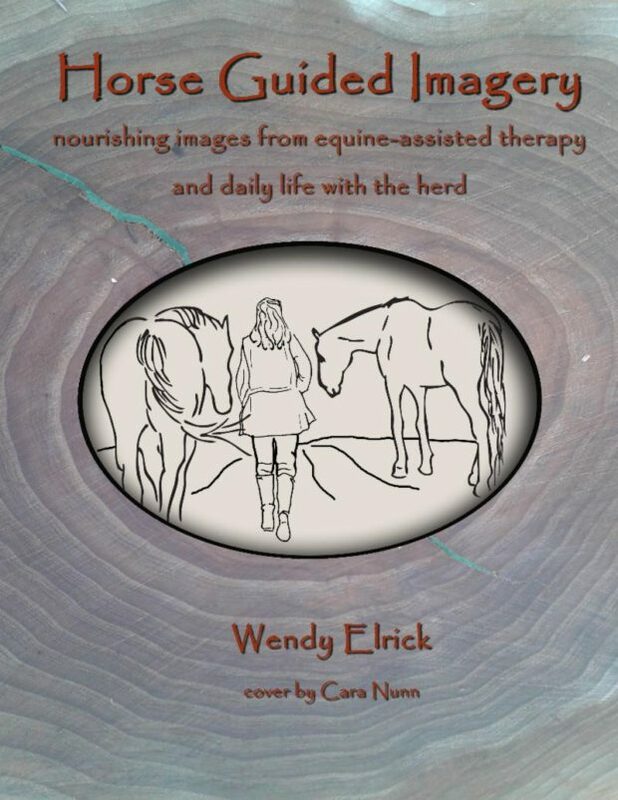 She had her head through the fence and the two horses were touching noses. She seemed to be sending him calm energy and reassurance. It was a beautiful image. To add to the unrest, that same morning we found a neighbouring miniature horse loose and running our bottom fence line. I thought maybe Joey was concerned about the little guy. However, the true story surfaced at the end of the day. A neighbour phoned to say a cougar was in the area. It hit me that Joey’s whinnying was him looking after his own vulnerability. He was physically not a strong pony, and he knew it. He would not be able to defend himself against a predator. He looked after his vulnerability by asking for protection, which Vienna provided. After the phone call, I opened up the pony pasture so Joey and Chunky would be with Vienna’s bunch and feel the safety of a bigger herd. His vulnerability does not take away from his strengths. Joey was very good at saying what he wanted. Like the time he escaped out of the arena and ran to some alfalfa hay on the other side of the property. Hay he had discovered a few days earlier when he was loose on the property. Similarly, our farrier tells a story of how Joey pushed, with his nose, a young rider off of the back of his friend pony Stormy. Apparently Joey walked decisively over to Stormy and the young rider, shoved his nose under the youth’s bottom, and flicked the human off of Stormy’s back! He was clearly saying that Stormy was not to be ridden! 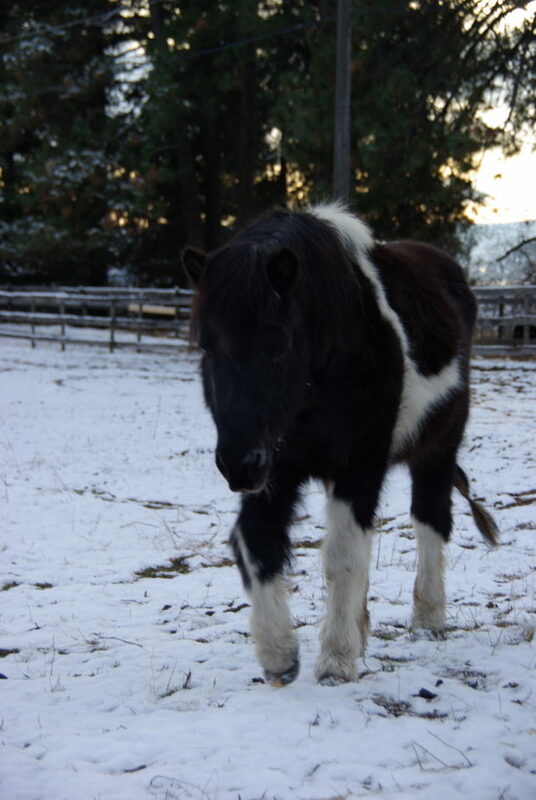 In his last year or so here on the property, he showed us how he wanted his vulnerability honoured. He was noticeably happier when living with a big horse. He lived with Landor until Landor died in June 2018. Then, he lived with Vienna until he, himself, died. Vienna stayed with Joey until he took his last breath. Even in dying, Joey looked after his vulnerability by taking himself to the shelter. He always stood in the corner of the bigger shelter when he did not feel well. That way he had protection on two sides. One of the other messages he gave us was that dying is what happens while we are here on Earth. He knew that the actual act of his body dying was simple compared to the dying we all do when we suffer. He knew lots about suffering. Our farrier rescued him when he was about six years old. He had been neglected and had been allowed to eat food that was too rich for him. The result was that his hooves were very, very long and he could not stand up. And yet, even with his physical challenges, he took pride in his body. One year, he had lice. His gorgeous mane was so thick. I did not trust that I would be successful getting all the lice out of such a mass of hair. So, I cut his mane off! He was quite upset. He told Zabrina that he was worried he was no longer handsome. Similarly, he appreciated a good grooming. Zabrina gave his tail and bum a wash in December, which he was very grateful for. Even when dying, he would not lay down in front of us. He knew it would not be graceful because he did not have the strength to lower himself. He knew he would crash to the ground. So, he propped himself up on the shelter wall. He went down after Zabrina said good-night around 11pm. He suffered with various physical ailments all of his life. He also found the best cure for disease – love. He was a master of opening his heart and sharing love with others. People would burst out laughing and express much joy after being with him for a little while. I will never forget one woman turning towards me with a big smile, laughing, exclaiming: “This guy is amazing! I love him!” He lived on hugs and kisses and positive attention. He taught us to open our hearts in response to suffering. In his memory we have hung a painted heart on the shelter wall, reminding us of his important teachings. Thank you Joey. We love you, always.